Mohler and Duncan discussed our conference and the conditionalist movement in their broader discussion about theological liberalism. In Mohler’s 2015 debate with me on Justin Brierley’s “Unbelievable?” radio program, he made similar claims about our movement having had modern origins, placing them in the middle of the twentieth century as a reaction to God allowing the horrors of genocide and two world wars.1“Unbelievable? Should Christians rethink Hell? Dr Al Mohler & Chris Date debate the traditional & conditionalist view,” Unbelievable? podcast, hosted by Justin Brierley, January 3, 2015, https://www.premierchristianradio.com/Shows/Saturday/Unbelievable/Episodes/ Unbelievable-Should-Christians-rethink-Hell-Dr-Al-Mohler-Chris-Date-debate-the-traditional-conditionalist-view (accessed April 17, 2018). In point of fact, in modern times our view gained prominence during nineteenth-century conservative theological debates around the world.2David Powys, “The Nineteenth and Twentieth Century Debates about Hell and Universalism,” Universalism and the Doctrine of Hell, ed. Nigel Cameron (Paternoster, 1992), 95. And while pushed to the fringes in the twentieth century, conditionalism has been brought back into the evangelical mainstream in recent decades. Mohler’s characterization of us as “those who style themselves evangelical” was clearly aimed at calling our conservative credentials into question, but he is aware that John Stott helped to style modern evangelicalism, and was among the British evangelicals who have held to our view and whom J. I. Packer called “honored fellow evangelicals.”3Chris Date, “Why J. I. Packer Is (Still) Wrong: A Response to The Gospel Coalition (Part 1),” Rethinking Hell [blog], October 23, 2015, http://www.rethinkinghell.com/2015/10/why-j-i-packer-is-still-wrong-a-response-to-tgc-part-1 (accessed April 25, 2018). The really low blow from Mohler came when he insinuated that our desire to “rethink hell” is born from questioning the truthfulness and authority of God’s word, like the serpent of Genesis. But as our Statement on Evangelical Conditionalism makes absolutely clear, not only do we affirm the essentials of evangelical Christianity, including belief in hell and final punishment, we are also adamant that “Scripture, not emotion, ultimately determines our convictions.” Mohler knows that I had invited him to speak at our conference, a choice clearly indicative of our non-liberal approach. He declined, but we ended up hearing from highly-regarded conservative speakers including Craig Evans and Gregg Allison. We invited Allison to speak to our conference on the traditional interpretation that hell is a place of eternal torment, and on the importance of taking seriously the weight of tradition, which he called “The Corpus/Consensus Theologicum of the Church.” This was exactly Mohler’s refrain in my debate with him, so it is ironic that he criticized our conference as if we had recklessly disregarded this conservative principle. Mohler should also know, better than anybody, the second principle we employ, namely, that it is possible for tradition to have interpreted the Bible wrongly. So we ought to be able to live up to the Protestant-evangelical calling and “rethink” the traditional interpretation in light of biblical study and debate, without being demonized by fellow evangelicals. We are not questioning God—Mohler is way too generous to his own position there—we are questioning fallible men, as fallible people ourselves. In my debate with Mohler, I made it clear that exegesis and a commitment to the authority of Scripture are what prompted me to reject the doctrine of eternal torment in favor of conditional immortality. I told my story of becoming convinced of the view, a journey that began in earnest when I first interviewed Edward Fudge, author of The Fire That Consumes, on my personal podcast.4“Episode 54: Burn It Up,” Theopologetics podcast, hosted by Chris Date, August 4, 2011, http://www.theopologetics.com/2011/08/04/episode-54-burn-it-up/ (accessed April 17, 2018); “Episode 55: Eternal Fire,” Theopologetics podcast, hosted by Chris Date, August 4, 2011, http://www.theopologetics.com/2011/08/04/episode-55-eternal-fire/ (accessed April 17, 2018). As I recounted early in that debate, “I insisted that [Fudge] not make as a primary plank of his argument the emotional, sentimental-type things, or philosophy. 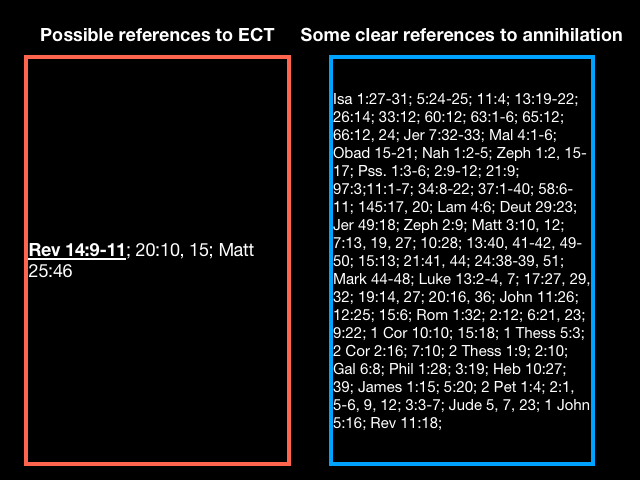 What I wanted, and what I want to this day, is exegesis. I want to know what the Bible says.” And at the other, tail end of the debate, I said, “I actually agree with Dr. Mohler. I don’t think that if the traditional view is true that it paints God out to be unjust, or an unjust ogre. I think we need to accept whatever Scripture says, whichever side of this debate it supports.” Accordingly, my case throughout my debate with Mohler was biblical. My commitment to the authority of Scripture, and to letting it dictate my convictions about hell, is shared by a great many in the conditionalist movement, including those whose emotions are most aroused by the traditional view—and Mohler knows it. For example, after admitting he is extremely troubled by the doctrine of eternal torment, Stott writes, “our emotions are a fluctuating, unreliable guide to truth and must not be exalted to the place of supreme authority in determining it. As a committed evangelical, my question must be—and is—not what does my heart tell me, but what does God’s Word say?”5John R. W. Stott, “Judgment and Hell,” Rethinking Hell: Readings in Evangelical Conditionalism, eds. Christopher M. Date, Gregory G. Stump, & Joshua W. Anderson (Cascade, 2014), 51. To his credit, Mohler acknowledges this in his contribution to Hell Under Fire, saying, “after giving vent to [his] emotions, Stott insisted that he must submit his theology to the test of Scripture, not the voice of his heart.”6R. Albert Mohler Jr., “Modern Theology: The Disappearance of Hell,” Hell Under Fire: Modern Scholarship Reinvents Eternal Punishment, eds. Christopher W. Morgan & Robert A. Peterson (Zondervan, 2004), 30. Deplorably, other critics—including two of Mohler’s co-contributors—omit these two important sentences of Stott’s in attempts to paint conditionalists as soft-hearted slaves to sentiment.7Robert W. Yarbrough, “Jesus on Hell,” Hell Under Fire: Modern Scholarship Reinvents Eternal Punishment, eds. Christopher W. Morgan & Robert A. Peterson (Zondervan, 2004), 88; Christopher W. Morgan, “Annihilationism: Will the Unsaved Be Punished Forever?” Hell Under Fire: Modern Scholarship Reinvents Eternal Punishment, eds. Christopher W. Morgan & Robert A. Peterson (Zondervan, 2004), 196. Edward Fudge is perhaps best known for his seminal case for conditional immortality, The Fire That Consumes, in which he affirms his own commitment to biblical authority. “I am a theist,” he writes, “a Christian and an evangelical, persuaded that Scripture is the very Word of God written. For that reason I believe it is without error in anything it teaches and that it is the only unquestionable, binding source of doctrine on this or any subject”8Edward William Fudge, The Fire That Consumes: A Biblical and Historical Study of the Doctrine of Final Punishment (Verdict, 1982), 22. Fudge goes on to admit, “It is often very easy to read into Scripture what we wish it said,” approvingly citing nineteenth-century Anglican conditionalist Richard Whately who “warns us not to mistake our own desires for the Bible’s teaching.”9Ibid., 25; italics in original. And in his written debate with Robert Peterson, Fudge observes, “The growing evangelical rejection of the traditional doctrine of unending conscious torment is not propelled by emotionalism, sentimentality or compromise with culture but by absolute commitment to the authority of Scripture.”10Edward William Fudge & Robert A. Peterson, Two Views of Hell: A Biblical and Theological Dialogue (InterVarsity, 2000), 21. Again, Mohler knows all of this, citing both of these volumes in his aforementioned book chapter. So two of the plenary speakers (Sprinkle and I) at the conference Mohler charged with being motivated by sentiment and embarrassment of the doctrine of eternal torment, and two well-known conditionalists (Stott and Fudge) with whom Mohler is publicly familiar, all affirm and exhibit a commitment to biblical authority. In fact, many who listened to my debate with Mohler might say that it seemed my commitment to the authority of Scripture eclipsed Mohler’s own. One blogger, for example, writes, “I expected to come away from the discussion [between Mohler and Date] as being firmly entrenched in the traditionalist position,” but “I was underwhelmed with Dr. Mohler’s arguments, which really boiled down to one argument for every text that Chris Date offered: “That’s not how the church for centuries has interpreted that text; if Chris is right, then the church has been wrong all these years.’”11Micah Cobb, “Dr. Al Mohler and Chris Date Debate the Annihilationist View of Hell,” Thinking and Believing [blog], posted February 27, 2015, http://micahcobb.com/blog/dr-al-mohler-and-chris-date-debate-the-annihilationist-view-of-hell/ (accessed April 18, 2018). Another blogger similarly opined, “One of the biggest problems with Al Mohler’s defense of the traditional view is how much he appealed to, well, tradition. . . . I think a stronger focus on exegesis would have been more compelling rather than a continued appeal to traditional church teaching.”12J. W. Wartick, “Debate Review: Al Mohler vs. Chris Date on ‘Should Christians Rethink Hell?’” Always Have a Reason [blog], March 9, 2015, https://jwwartick.com/2015/03/09/mohler-date/ (accessed April 18, 2018). To be clear, I do not think I am any more committed to the authority of Scripture than Mohler. But I also do not think it is wise to assume one knows what motivates a person, especially when one’s assumptions fly in the face of all available evidence, as Mohler’s do in this case. the finally impenitent must ultimately die, rather than live forever in hell, either because Christ did not die in their place as their substitute (as per the Reformed doctrine of particular redemption), or because they refuse to accept his substitutionary but provisional death on their behalf (as per a particularist take on universal atonement).”16Ibid., 82. 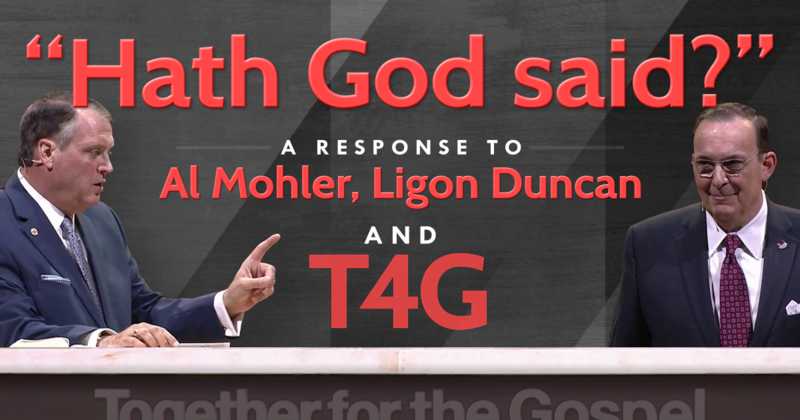 But what is especially ironic is that Mohler goes on to say, “I think this goes right back to, ‘Hath God said,’” a reference to Genesis 3:1–5 in which the serpent prompts Eve to doubt the veracity of God’s earlier warning against eating from the forbidden tree. “You may freely eat fruit from every tree of the orchard,” he had said, “but you must not eat from the tree of the knowledge of good and evil, for when you eat from it you will surely die” (Gen 2:16–17, NET; emphasis added).17According to most translations, the first humans would die “in the day” (e.g, ESV) or “on the day” (e.g., CSB) they ate of the fruit. However, as Walter Kaiser explains, the Hebrew idiom points “to the certainty of the predicted consequence that would be set in motion by the act initiated on that day.” (Walter C. Kaiser Jr. et. al., Hard Sayings of the Bible [InterVarsity, 1996], 91; italics in original.) But the serpent assured Eve, “You will not surely die” (Gen 3:5; emphasis added). Despite the Apostle’s teaching that “the wages of sin is death” (Romans 6:23), John Gill affirmed the immortality of the risen lost, saying that the body that rises “dies not again.” John Wesley likewise said that after the resurrection, “neither the righteous nor the wicked were to die any more.” According to Charles Spurgeon, rather than die again the lost will “live for ever in torment.” Many contemporary traditionalists agree: John MacArthur says, “Every human being ever born lives forever;” Greg Koukl and Christopher Morgan say, “everybody lives forever;” Wayne Grudem writes that the lost will “live forever in hell;” Gary Habermas and J.P. Moreland write that the unsaved “will continue living in a state with a low quality of life.”18Chris Date, “Obfuscating Traditionalism: No Eternal Life in Hell?” Rethinking Hell [blog], October 12, 2013, http://www.rethinkinghell.com/2013/10/obfuscating-traditionalism-no-eternal-life-in-hell (accessed April 22, 2018). I repeat: I do not think I am any more committed to the authority of Scripture than Mohler. But if he is going to tell people that they will live forever despite God’s assurance that they will not, he might not want to compare conditional immortality to the serpent’s first lie when his own view of hell is so much more comparable. 1. ￪ “Unbelievable? Should Christians rethink Hell? Dr Al Mohler & Chris Date debate the traditional & conditionalist view,” Unbelievable? podcast, hosted by Justin Brierley, January 3, 2015, https://www.premierchristianradio.com/Shows/Saturday/Unbelievable/Episodes/ Unbelievable-Should-Christians-rethink-Hell-Dr-Al-Mohler-Chris-Date-debate-the-traditional-conditionalist-view (accessed April 17, 2018). 2. ￪ David Powys, “The Nineteenth and Twentieth Century Debates about Hell and Universalism,” Universalism and the Doctrine of Hell, ed. Nigel Cameron (Paternoster, 1992), 95. 3. ￪ Chris Date, “Why J. I. Packer Is (Still) Wrong: A Response to The Gospel Coalition (Part 1),” Rethinking Hell [blog], October 23, 2015, http://www.rethinkinghell.com/2015/10/why-j-i-packer-is-still-wrong-a-response-to-tgc-part-1 (accessed April 25, 2018). 4. ￪ “Episode 54: Burn It Up,” Theopologetics podcast, hosted by Chris Date, August 4, 2011, http://www.theopologetics.com/2011/08/04/episode-54-burn-it-up/ (accessed April 17, 2018); “Episode 55: Eternal Fire,” Theopologetics podcast, hosted by Chris Date, August 4, 2011, http://www.theopologetics.com/2011/08/04/episode-55-eternal-fire/ (accessed April 17, 2018). 5. ￪ John R. W. Stott, “Judgment and Hell,” Rethinking Hell: Readings in Evangelical Conditionalism, eds. Christopher M. Date, Gregory G. Stump, & Joshua W. Anderson (Cascade, 2014), 51. 6. ￪ R. Albert Mohler Jr., “Modern Theology: The Disappearance of Hell,” Hell Under Fire: Modern Scholarship Reinvents Eternal Punishment, eds. Christopher W. Morgan & Robert A. Peterson (Zondervan, 2004), 30. 7. ￪ Robert W. Yarbrough, “Jesus on Hell,” Hell Under Fire: Modern Scholarship Reinvents Eternal Punishment, eds. Christopher W. Morgan & Robert A. Peterson (Zondervan, 2004), 88; Christopher W. Morgan, “Annihilationism: Will the Unsaved Be Punished Forever?” Hell Under Fire: Modern Scholarship Reinvents Eternal Punishment, eds. Christopher W. Morgan & Robert A. Peterson (Zondervan, 2004), 196. 8. ￪ Edward William Fudge, The Fire That Consumes: A Biblical and Historical Study of the Doctrine of Final Punishment (Verdict, 1982), 22. 9. ￪ Ibid., 25; italics in original. 10. ￪ Edward William Fudge & Robert A. Peterson, Two Views of Hell: A Biblical and Theological Dialogue (InterVarsity, 2000), 21. 11. 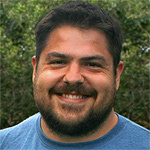 ￪ Micah Cobb, “Dr. Al Mohler and Chris Date Debate the Annihilationist View of Hell,” Thinking and Believing [blog], posted February 27, 2015, http://micahcobb.com/blog/dr-al-mohler-and-chris-date-debate-the-annihilationist-view-of-hell/ (accessed April 18, 2018). 12. ￪ J. W. Wartick, “Debate Review: Al Mohler vs. Chris Date on ‘Should Christians Rethink Hell?’” Always Have a Reason [blog], March 9, 2015, https://jwwartick.com/2015/03/09/mohler-date/ (accessed April 18, 2018). 13. ￪ Peter Grice, “Why ‘Rethinking Hell’?” Rethinking Hell [blog], June 12, 2012, http://www.rethinkinghell.com/2012/06/why-rethinking-hell (accessed April 18, 2018). 14. ￪ Christopher M. Date, “The Righteous for the Unrighteous: Conditional Immortality and the Substitutionary Death of Jesus,” McMaster Journal of Theology and Ministry 18 (2016–2017), 71; italics in original. 15. ￪ And as I explain in a footnote, “Notwithstanding novel attempts to characterize the traditional view differently, Ronnie Demler demonstrates conclusively that this is, in fact, what leading defenders of eternal torment have said throughout church history,” in his contribution to our book, A Consuming Passion (Ibid., 69n1). 17. ￪ According to most translations, the first humans would die “in the day” (e.g, ESV) or “on the day” (e.g., CSB) they ate of the fruit. However, as Walter Kaiser explains, the Hebrew idiom points “to the certainty of the predicted consequence that would be set in motion by the act initiated on that day.” (Walter C. Kaiser Jr. et. al., Hard Sayings of the Bible [InterVarsity, 1996], 91; italics in original. 18. ￪ Chris Date, “Obfuscating Traditionalism: No Eternal Life in Hell?” Rethinking Hell [blog], October 12, 2013, http://www.rethinkinghell.com/2013/10/obfuscating-traditionalism-no-eternal-life-in-hell (accessed April 22, 2018).